Having worked my way through Tony Smibert’s Painting Landscapes from your Imagination throughout this past month here is the final paragraph of the book, which will explain the origin of today’s painting, my “original” variation on the book’s last exercise. “I hope this book has encouraged you. 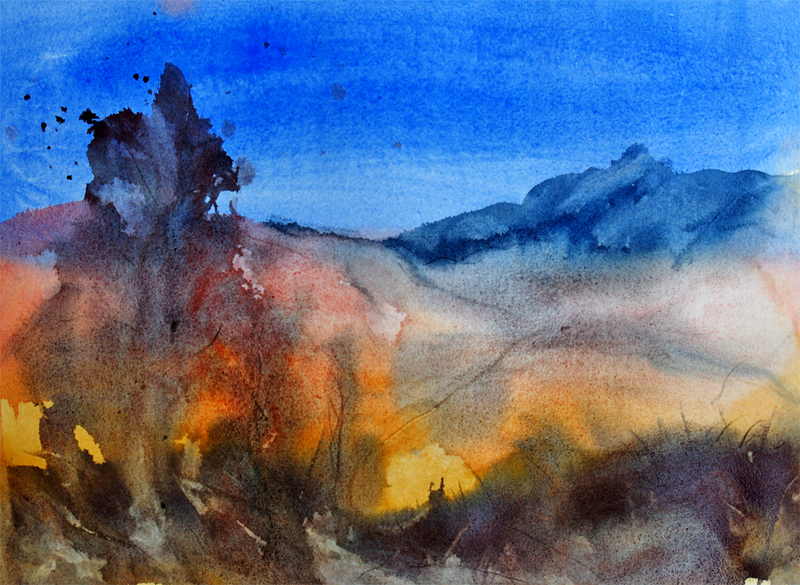 There’s room in the watercolour world for you to take any technical and aesthetic direction you choose. So become an original! Work with the medium in your own way. Adapt, absorb, modify and utilize my suggestions or anyone else’s in any way that works for you! Great final words in an inspiring book from which I have learnt so much. love the fiery orange paired with the cobalt sky, they sing! The words and concept of …. Become An Original….. can never be overemphasized. lovely painting and post Andrew. Thanks so much Debi. So many great quotes in the book (just like your blog :-)) Hope you’re having fun. I must get the book out again 🙂 lots of fun over here! I see a fire burning, lapping the trees and throwing their ashes into the sky which remains resolutely unmoved by the fires attempt to colour it. It looks like you really, really had fun making this painting. I like the way it settles midway between abstract and representative. Lovely painting. That quote really speaks to me too. Lately I’ve been playing with watercolor and oil pastel, which I really love and trying to make it “my own.” The quote encourages me to continue.